The product is true to what is described...the color is accurate. Material is what it says, however with this print I would have preferred this to be in a flannel. If you are searching for the perfect plaid to update your room, Brody is the way to go. The top of the comforter is a green and blue plaid pattern that is printed onto a polyester peach skin material with a solid blue reverse. Corresponding shams feature a 2-inch flange around the edges. 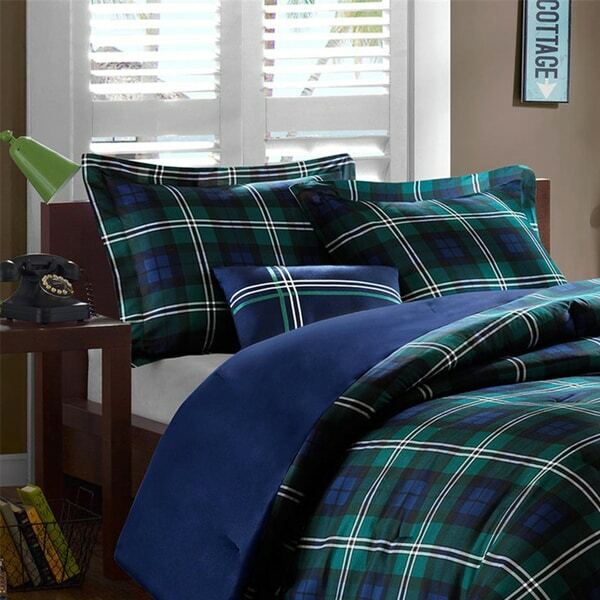 This set is complete with a decorative pillow in corresponding blue and green colors with a pop of white plaid. Brought this comforter set for my son's college apt. It was a nice masculine design. The comforter was plush by college standards and the shams AND the extra pillow made the bed look cozy and comfortable. The price was great considering what you got for it. Very poorly made. Invest for something nicer!! This is my first ever review I have felt I needed to write. This set is very poorly manufactured. The fabric is cheap feeling, there were bad spots in fabric all over the pillow sham and the accent pillow had a 3 inch hole in it... I can sew the pillow I guess. Not worth the hassle of sending back. Don’t buy!! Nice colors and good value, but because it is polyester, the comforter has more of a sheen/swooshy feel like shiny pants rubbing together. Not as cozy as cotton. Love this comforter for my teenaged son! We were looking for a plaid comforter to go with a snow ski themed bedroom. This fit the bill perfectly. My son loved it! We are very happy with this set! This is a very nice comforter set. The fabric is nice and the comforter fits the bed well. My only complaint is that the colors of the fabric are darker than shown. I expected royal blue -- it's navy; I expected a bright green -- it's dark (more like hunter green). I bought this for my son for his purchasing a new full size high quality bed set. He absolutely loves it because I bought him a similar one when we bought him his twin bed 13 years ago. He was thrilled he could have another comforter that is actually more beautiful than his first one. This comforter set was a great purchase! The colors are as shown, and perfect for my cabin in the mountains. As the cabin is a vacation rental, the bedding is all washed frequently. The comforter washes well, and the colors have not faded. I would buy this again! I was looking for comforters for my teenage boys. I wanted decent quality, no down due to allergies, and the boys wanted something that wasnt girly. I got that and more. Really soft and comfortable for a price that was unbelievable. I highly recommend this comforter. The comforter is nice but does not look at all like the picture. The bright pretty green is dark green and the reverse side is dark blue not the royal blue pictured. Disappointed. I expected a little higher quality then I received. It certainly wasn’t the worst , but could be a little better. I would recommend this set to friends. I bought this set for my nephew's dorm room and it's the perfect set for a teenager who doesn't take care of anything. It's inexpensive, yet stylish. So cute. Easy to make bed & it keeps it shape! Excellent bedding. Makes a great young man's room set. I would recommend it. You can't go wrong. perfect colors for my 13 y/o son.